Mon-Fri, 9 A.M. - 5 P.M. | Entrance free! 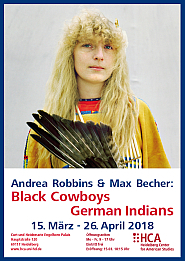 During the 2018 spring break, the HCA presented a photo exhibition by the German-American couple Max Becher and Andrea Robbins. Their fascinating photographs shed light on two extraordinary social phenomena, Black cowboys in the United States and the emulation of Native American culture in Germany. At the height of the cattle ranching period of the 19th century, over one-third of all cowboys were African American. Black cowboy culture still thrives, yet little remains known to the general public and is essentially unheard of outside the United States. This marginalization was primarily the result of both official and unofficial segregation in competitive rodeos. Interestingly, the term “cowboy” is reputed to have originated on plantations, where slaves had titles like “houseboy,” “fieldboy,” and “cowboy.” After abolition, the independence provided by the demanding but dignified cowboy lifestyle was preferable to sharecropping for many freed men and women. They combined riding techniques adapted from Native Americans with knowledge of animal husbandry and cow herding skills, which many trace back to African traditions. In the world of competitive rodeos, even famous Black cowboys such as Bill Pickett — the inventor of “bull dogging,” a popular steer wrestling event — were either excluded from participating with white cowboys or were given time to compete after the close of the main events. This segregation created the need for a separate African American rodeo culture. Across the United States, Black riding clubs meet regularly and hold trail rides, backyard jackpot rodeo competitions, and charity events. Competitions take place year round and are increasingly popular and inclusive, blurring the lines between professional cowboys and enthusiasts, country and urban culture, as well as southern and northern traditions. These rodeo activities provide an opportunity to reunite families and introduce young people to their cultural history as well as the land that was left behind after the Great Migration of African Americans out of the South, in the early twentieth century. Becher and Robbins’ pictures, taken between 2008 and 2017, show that black cowboys have formed an evolving culture and style that blends the archetypal cowboy image with hip-hop and soul influences. The other part of the exhibition was shot in Radebeul near Dresden in 1997 and 1998, where the birthday of Karl May is celebrated annually by hundreds of Germans dressed as Native Americans. 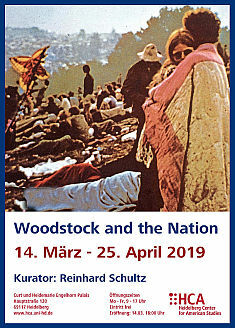 The extraordinary fascination of Germans with Native Americans can be explained by the popularity of May’s work that portrayed Native Americans as heroes and whites as villains as well as a deep-rooted romantic view of a preindustrial past. Although the “pro-Indian” slant of Karl May can be understood as a progressive, anti-colonial message, his writings became inadvertently intertwined with an important part of Nazi mythology. German fascists identified with the Indian as noble savage and as the victim of a modern, corrupt, overly intellectual world. Adolf Hitler was a fan and avid reader of May’s work, and despite his sympathy for the Indians, he found inspiration in the way they had been either rounded up into reservations or exterminated to make room for westward expansion. After World War II, the east-west division of Germany caused a split in the culture of Native American emulation. In East Germany, Indian fan clubs increased because they were a legal opportunity to gather in large numbers, and Karl May’s anti-American, anti-capitalist messages coincided with Eastern-Bloc rhetoric. In West Germany, the influx of American popular culture expanded the imagery of the American West, but conflicted with May’s sympathetic descriptions of indigenous Americans. (Adapted from a text by Andrea Robbins und Max Becher.) On opening night, Frank Usbeck, author of Fellow Tribesmen: The German Image of Indians, the Emergence of National Identity, and Nazi Ideology in German Periodicals and 2011 winner of the Rolf Kentner Dissertation Prize, talked about the long-standing German infatuation with Native Americans and then invited the audience take a first look at a fascinating exhibition. ​​"The Cold War: Origins - History - Legacy"
On March 16, 2017, yet another exhibition opened in the HCA’s Atrium: “The Cold War: Origins - History – Legacy,” created by the Berlin Center for Cold War Studies and the Bundesstiftung Aufarbeitung, a federal foundation for the study of the Communist dictatorship in Eastern Germany. More than 160 photographs, documents, and charts looked at the years between 1945 and 1991 – from the end of World War II to the dissolution of the Soviet Union. Considering recurrent tensions in East-West relations and the ongoing debate about a return of the Cold War, the exhibition seemed especially timely. It depicted the ideological, political, military, and economic dimensions of the Cold War in a global perspective and reminded its visitors how profoundly this conflict shaped societies on both sides of the Iron Curtain. One focus of the exhibition were the dynamics of the nuclear arms race, which was decisive for the origin and aggravation of the Cold War; another the “hot wars” in the “Third World,” the effects of which continue until today; a third the diplomatic and civic initiatives that managed to contain the Cold War at least temporarily. This exhibition invited its visitors on opening night and in the ensuing weeks to look back; at the same time, it linked the history of the Cold War to current international conflicts and pointed out the legacies facing Europe today. Bernd Greiner from the Berlin Center for Cold War Studies returned to some of these themes in his opening night lecture “The Cold War: Observations on an Age of Extremes“. Professor Greiner’s talked was followed by a lively discussion, and many guests also used the opportunity to take a first look at the exhibit. ​​"Dorothea Lange: Iconic American Photography"
Dorothea Lange was a pioneer of American documentary photography. Eighty years ago, she joined her colleagues Walker Evans and Gordon Parks in documenting the plight of sharecroppers, displaced farm families, and migrant workers for the Resettlement Administration and the Farm Security Administration. In March 1936 Lange passed through a pea pickers camp in Nipomo Mesa, California and shot the iconic pictures of Florence Owens Thompson, the "Migrant Mother" who became the face of the uprooted women and men of the Great Depression. Some of Lange‘s pictures appeared in the San Francisco News on March 10. As a result, food was delivered to the camp to prevent starvation. Dorothea Lange‘s pictures had a lasting impact on documentary photography. Her pictures of marches and strikes, welfare recipients and migrant workers, people waiting in bread lines or at labor exchanges left their stamp on the collective memory of the Great Depression in America and became widely known. On occasion of the eightieth anniversary of "Migrant Mother," the HCA showed a selection of Dorothea Lange‘s iconic photography, curated by Reinhard Schultz: portraits of the unemployed and homeless, migrants and farm workers, but also little known pictures of big landowners and women factory workers. Many interested visitors joined us for the opening night in the Atrium and continued to come during the following five weeks. "Behind Barbed Wire – Prisoners of War in the United States and Germany"
During World War II, more than two million American soldiers fought in Europe. About 90,000 of them came to Germany as prisoners of war, whereas about 370,000 German POWs were interned in the United States. The exhibition “Behind Barbed Wire” shed light on their lives on both sides of the Atlantic. The more than forty panels illustrated the capture, life in the camps, the return home as well as acts of reconciliation after the war. While all POW experiences revolve around issues of war and peace, justice under arms, human rights, and international reconciliation, the everyday experience in the camps could not have been more different. Many American POWs only survived with food and medical supplies from the Red Cross, whereas German soldiers were often sent out to harvest crops, build roads, lay city sewers and construct housing. In the Midwest, many of their supervisors could still speak German, and some even found relatives or former neighbors among the interned. On the other hand, more than half of the American POWs came from the Midwest, and many of them had German roots. The exhibition documented several cases that illustrate this entangled history: Some farmers sent CARE packages to POWs’ families after the men returned, many exchanged letters or cards for many years after the war, and many POWs happily revisited the U.S. after the war; it is estimated that about five per cent of German POWs eventually emigrated to the United States. In the American camps, German soldiers witnessed democracy and individual freedom, and some of them returned to actively participate in the founding of the German post war democracy. Die besten Cartoons, die der New Yorker nie druckte"
The New Yorker is not only known for its excellent reporting, commentary, and literature but is also regarded as the Pantheon of American humor. To have a cartoon published in The New Yorker is the ultimate accolade for every cartoonist. In March and April 2014, the HCA (in cooperation with Galerie Caricatura, Kassel) showed the “Rejection Collection,“ a selection from 250 Cartoons by New Yorker regulars that were never printed – the best of the rest. Strolling through the exhibition, one could not help but notice that some of the cartoons were truly too dumb, too dark, too naughty, too politically incorrect, or simply too bizarre to be published in the venerable magazine. Yet, most cartoons are actually rejected because of the sheer mass submitted to The New Yorker – about 500 a week by the regulars alone. From March 14 to April 25, the HCA showed the exhibition „The Early Days – HipHop in East Germany.“ Photographs, t-shirts, radio cassette recorders and other everyday objects served as illustrations of an unusual piece of East German history and showed that in the 1980s, HipHop constituted a truly global youth culture that transcended the Iron Curtain. The four elements of HipHop culture – breakdance, DJ-ing, rap and graffiti – originated in the New York Bronx. A distinct scene developed quickly in East Germany, challenging the SED state. The movie Beat Street made it to East German movie theaters in 1985 and facilitated HipHop culture in almost all regions of East Germany as well as its networks. HipHop was not prohibited in East Germany but the party wanted to control and contain it where necessary. The exhibition took a look at the main actors of the HipHop movement and their relationship to the authorities as well as at the spaces breakdancers, rappers, and graffiti artists claimed on the other side of the wall. The exhibition focused on the biographies of the protagonists, based on interviews with contemporaries. Archival material and everyday objects from private collections. Visitors could admire the youngsters‘ gifts for improvisation: “Fat Laces“ were made from old shirts. Graffiti was painted on the wall after spray cans had been prohibited. For the exhibition opening the HCA welcomed Reno Rössel from the Steinhaus Bautzen e.V., who had conceptualized the exhibition together with the University of Leipzig. The large audience also enjoyed a screening of Nico Raschik‘s movie Here We Come (2006), a portrayal of the HipHop protagonists in East Germany, and had an opportunity to talk to the director. Melvin J. Lasky – New York, Berlin, London"
Once more, the entrance way of the HCA and the atrium served as an exhibition space. From March 22 to April 26, an exhibition told the life story of Melvin Lasky, one of the preeminent personas of the cultural Cold War. Few American journalists were as well known in Western Europe as the extremely well-read and well-connected Lasky. And few were as controversial. Born in New York in 1920 and raised in the Bronx, the son of Polish Jews was an ardent Trotskyist who turned into a fervent anti-communist and “culture warrior” after 1945. Lasky’s biography impressively reflects the big ideological disputes of the twentieth century. Curated by Maren Roth and Charlotte Lerg, both of the Lasky Center for Transatlantic Studies at the University of Munich, the exhibit recounted Lasky’s life, a “tale of three cities”: New York – Berlin – London. Its first part documented Lasky’s early years in New York, his education at City College, the University of Michigan, and Columbia University and his work for the New Leader in New York, where he was editor from 1942–1943. After serving in World War II as a combat historian for the 7th Army, Lasky remained in Berlin, where he worked for American military governor Lucius D. Clay. Soon after, Lasky received Marshall Plan funding to create the German-language journal Der Monat, one of the most influential monthlies of the young Federal Republic, appealing to socially progressive but anti-communist intellectuals. Contributors included, among others, George Orwell, Hannah Arendt, Thomas Mann, Heinrich Böll, Max Frisch, T. S. Eliot, Saul Bellow, and Richard Löwenthal. The exhibition impressively detailed Lasky’s extensive networks, which he built and maintained as the editor of Der Monat and as the founder of the Congress for Cultural Freedom (CCF) at a 1950 conference in West Berlin, both partially financed by the CIA. In 1953, Lasky also became editor of the Encounter, in many respects a British version of the Monat. He moved to London in the late 1950s and remained a sharp intellectual and a busy networker until the end of the Cold War, when he returned to Berlin for good. The numerous visitors of this exhibition on “cold war politics” certainly left with new insights on the cultural aspects of the Cold War. "The Civil Rights Struggle, African American GIs, and Germany"
Since the end of World War II, almost three million African American soldiers have been stationed in Germany. Many of them contributed to the defeat of the Third Reich. Their experience as part of the occupation army in Germany, where – in contrast to the United States – institutionalized racism did not exist after 1945, became an important impulse for the African American civil rights movement. In the 1960s, the German student movement became an important platform for civil rights activists in- and outside the U.S. Army in Germany. These little known aspects of civil rights history are now being documented in a digital archive and a photo exhibition that is on display at the HCA in April and May after showings in Berlin, Munich, Hamburg and San Francisco, to name a few. The objects in the exhibition range from pictures of black soldiers at the end of the war over cartoons from the 1940s and 1950s and flyers of the student movement to a poster expressing solidarity with Angela Davis. In the digital archive directed by the two curators of the exhibition, Maria Höhn of Vassar College and Martin Klimke of the HCA and the Germans Historical Institute in Washington, DC, researchers of these three institutions explore the question to what extent the creation of American military institutions outside of the United States facilitated the U.S. civil rights movement. The digital archive documents the experiences of Afro American soldiers, activists, and intellectuals in twentieth century Germany and thus adds a transnational dimension to the history of the American civil rights movement. With this photo exhibition, the HCA utilized its atrium as an exhibition space for the first time and could welcome a sizeable crowd for the opening, among them members of the U.S. Army and the Rhein-Neckar Branch of the National Association for the Advancement of Colored People.